The Trust for Public Land worked closely with the City of Aurora, the Hoffman Youth Community Center, and families and youth in the neighborhood to redesign and completely transform Jewell Park into asset for both the Hoffman Center programs and the surrounding community. By reconfiguring the formerly awkward and unsafe parking lot that dominated the park and separated the usable park space, the Trust for Public Land more than doubled the park’s size and improved access and connection to the fabric of the neighborhood. Today, the neighborhood has a new multi-purpose plaza with a basketball court, meditation labyrinth, chess tables, skate park, and space that can be used for yoga and tai chi. 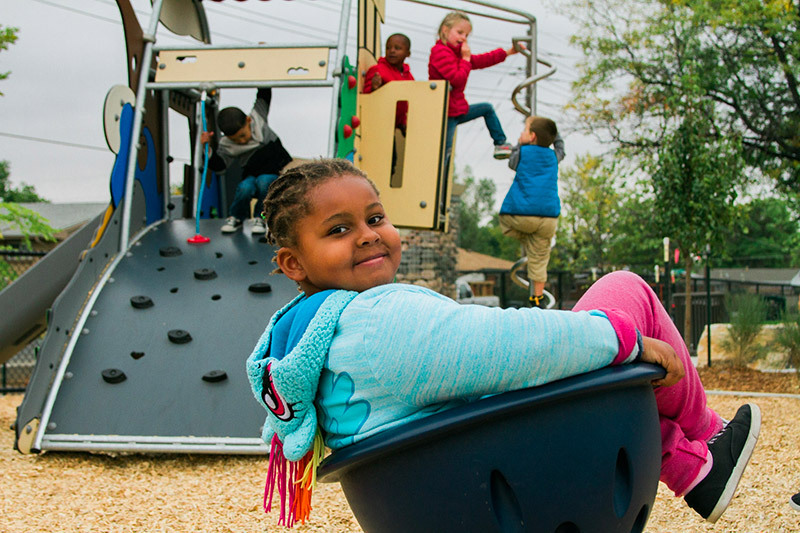 Kids can play on a cool new playground, with net climbers, swings, and spinners. Now a true neighborhood gem, the "new" Jewell Park will be enjoyed by the community for years to come.